29. X. Tian, R.R. Negenborn, P.J. van Overloop, J.M. Maestre, A. Sadowska, N. van de Giesen. Efficient multi-scenario model predictive control for water resources management with ensemble streamflow forecasts. Advances in Water Resources, vol. 109, pp. 58-68, 2017. 28. X. Tian, B.E. Aydin, R.R. Negenborn, N. van de Giesen, J.M. Maestre. Model predictive control for water level control in the case of spills. Journal of Irrigation and Drainage Engineering, vol. 143, no. 3, 2017. 27. S. Li, H. Zheng, R.R. Negenborn, G. Lodewijks. Coordination for efficient transport over water. In Proceedings of the 19th IEEE International Conference on Computer Supported Cooperative Work in Design (IEEE CSCWD'15), Calabria, Italy, pp. 389-394, May 2015. 26. R.R. Negenborn, C. Ocampo-Martinez. Perspectives on transport of water versus transport over water. In Transport of Water versus Transport over Water (C. Ocampo-Martinez, R.R. Negenborn, eds. ), Springer, pp. 1-10, 2015. 25. X. Tian, R.R. Negenborn, P.J. van Overloop, J.M. Maestre, E. Mostert. Model predictive control for incorporating transport of water and transport over water in the dry season. In Transport of Water versus Transport over Water (C. Ocampo-Martinez, R.R. Negenborn, eds. ), Springer, pp. 191-210, 2015. 24. V. Puig, C. Ocampo-Martinez, R.R. Negenborn. Model predictive control for combined water supply and navigability/sustainability in river systems. In Transport of Water versus Transport over Water (C. Ocampo-Martinez, R.R. Negenborn, eds. ), Springer, pp. 13-33, 2015. 23. X. Tian, P.J. van Overloop, R.R. Negenborn, N. van de Giesen. Operational flood control of a low-lying delta system using large time step Model Predictive Control. Advances in Water Resources, vol. 75, pp. 1-13, January 2015. 22. H. Zheng, R.R. Negenborn, G. Lodewijks. Model predictive control of a waterborne AGV at the operational level. In Proceedings of the International Maritime and Port Technology and Development Conference (MTEC 2014), Trondheim, Norway, pp. 99-108, October 2014. 21. X. Tian, R.R. Negenborn, P.J. van Overloop, E. Mostert. Model predictive control for water management using adaptive prediction accuracy. In Proceedings of the 11th International Conference on Hydroinformatics (HIC 2014), New York, USA, August 2014. Paper 1183. 20. H. Zheng, R.R. Negenborn, G. Lodewijks. Survey of approaches for improving the intelligence of marine surface vehicles. In Proceedings of the 16th International IEEE Conference on Intelligent Transportation Systems (IEEE ITSC 2013), The Hague, The Netherlands, pp. 1217-1223, October 2013. 19. J.L. Nabais, R.R. Negenborn, R.B. Carmona Benitez, M.A. Botto. A constrained MPC heuristic to achieve a desired transport modal split at intermodal hubs. In Proceedings of the 16th International IEEE Conference on Intelligent Transportation Systems (IEEE ITSC 2013), The Hague, The Netherlands, pp. 714-719, October 2013. 18. S. Li, R.R. Negenborn, G. Lodewijks. Survey on planning problems in inland waterway transport: Current status and future perspectives. In Proceedings of the 16th International IEEE Conference on Intelligent Transportation Systems (IEEE ITSC 2013), The Hague, The Netherlands, pp. 1231-1237, October 2013. 17. X. Tian, P.J. van Overloop, R.R. Negenborn, J.M. Maestre. Incorporating transport over water in the multi-objective water management of the Lake IJssel area in the Netherlands. In Proceedings of the 2013 IEEE International Conference on Networking, Sensing and Control (ICNSC'13), Paris, France, April 2013. Paper 167. 16. H. van Ekeren, R.R. Negenborn, P.J. van Overloop, B. De Schutter. Time-instant optimization for hybrid model predictive control of the Rhine-Meuse Delta. Journal of Hydroinformatics, vol. 15, no. 2, pp. 271-292, 2013. 15. M. Xu, R.R. Negenborn, P.J. van Overloop, N.C. van de Giesen. De Saint-Venant equations-based model assessment in model predictive control of open channel flow. Advances in Water Resources, vol. 49, no. 2012, pp. 37-45, 2012. 14. X. Tian, J.M. Maestre, P.J. van Overloop, R.R. Negenborn. Distributed model predictive control for multi-objective water system management. In Proceedings of the 10th International Conference on Hydroinformatics (HIC 2012), Hamburg, Germany, July 2012. Paper 175. 13. V. Puig, C. Ocampo-Martinez, J. Romera, J.Quevedo, P. Rodriguez, S. de Campos, R.R. Negenborn. Model predictive control of combined irrigation and water supply systems: Application to the Guadiana river. In Proceedings of the 2012 IEEE International Conference on Networking, Sensing and Control (ICNSC 2012), Beijing, China, pp. 85-90, April 2012. 12. H. van Ekeren, R.R. Negenborn, P.J. van Overloop, B. De Schutter. Hybrid model predictive control using time-instant optimization for the Rhine-Meuse Delta. In Proceedings of the 2011 IEEE International Conference on Networking, Sensing and Control (ICNSC 2011), Delft, The Netherlands, pp. 216-221, April 2011. 11. P.J. van Overloop, R.R. Negenborn, D. Schwanenberg, B. De Schutter. Towards integrating water prediction and control technology. In Proceedings of the 2011 IEEE International Conference on Networking, Sensing and Control (ICNSC 2011), Delft, The Netherlands, pp. 80-85, April 2011. 10. I. Alvarado, D. Limon, D. Munoz de la Pena, J.M. Maestre, M.A. Ridao, H. Scheu, W. Marquardt, R.R. Negenborn, B. De Schutter, F. Valencia, J. Espinosa. A comparative analysis of distributed MPC techniques applied to the HD-MPC four-tank benchmark. Journal of Process Control, vol. 21, no. 5, pp. 800-815, June 2011. 9. R.R. Negenborn, P.J. van Overloop, B. De Schutter. Coordination of local controllers in large-scale water systems. In Proceedings of the 9th International Conference on Hydroinformatics 2010 (HIC2010), Tianjin, China, pp. 2178-2185, September 2010. 8. P.J. van Overloop, R.R. Negenborn, S.V. Weijs, W. Malda, M.R. Bruggers, B. De Schutter. Linking water and energy objectives in lowland areas through the application of model predictive control. In Proceedings of the 2010 IEEE International Conference on Control Applications (2010 CCA), Yokohama, Japan, pp. 1887-1891, September 2010. 7. S. Leirens, J.M. Giraldo, R.R. Negenborn, B. De Schutter. A pattern search method for improving the operation of sewer systems. In Proceedings of the 12th IFAC Large Scale Systems Symposium (LSS 2010), Villeneuve d'Ascq, France, July 2010. 6. S. Leirens, C. Zamora, R.R. Negenborn, B. De Schutter. Coordination in urban water supply networks using distributed model predictive control. In Proceedings of the 2010 American Control Conference (ACC'10), Baltimore, Maryland, pp. 3957-3962, June 2010. 5. R.R. Negenborn, P.J. van Overloop, T. Keviczky, B. De Schutter. Distributed model predictive control for irrigation canals. Networks and Heterogeneous Media, vol. 4, no. 2, pp. 359-380, June 2009. 4. P.J. van Overloop, R.R. Negenborn, B. De Schutter, N.C. van de Giesen. Predictive Control for National Water Flow Optimization in The Netherlands. In Intelligent Infrastructures (R.R. Negenborn, Z. Lukszo, H. Hellendoorn, eds. ), Springer, Dordrecht, The Netherlands, pp. 439-461, 2010. 3. R.R. Negenborn, A. Sahin, Z. Lukszo, B. De Schutter, M. Morari. A non-iterative cascaded predictive control approach for control of irrigation canals. In Proceedings of the 2009 IEEE International Conference on Systems, Man, and Cybernetics (SMC 2009), San Antonio, Texas, pp. 3652-3657, October 2009. 2. R.R. Negenborn, P.J. van Overloop, B. De Schutter. Coordinated distributed model predictive reach control of irrigation canals. In Proceedings of the European Control Conference 2009 (ECC'09), Budapest, Hungary, pp. 1420-1425, August 2009. 1. R.R. Negenborn, B. De Schutter. 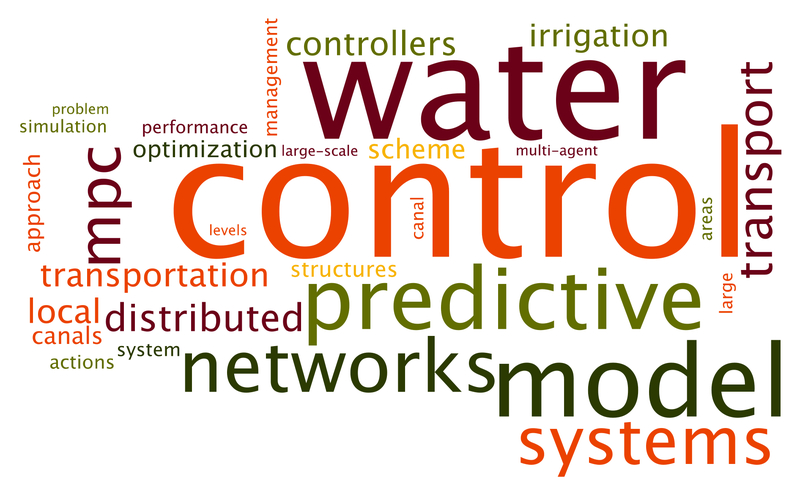 A distributed model predictive control approach for the control of irrigation canals. In Proceedings of the International Conference on Infrastructure Systems 2008 (INFRA 2008), Rotterdam, The Netherlands, November 2008.